Next Wednesday night, September 22nd, the week-long holiday of Sukkot begins. Also known as the Festival of Booths, this is an agricultural holiday commemorating how the Nation of Israel lived while wandering in the desert and celebrating the harvest season. Looking to get in on the Sukkah action? Here’s a review of great public Sukkot (plural of Sukkah, the holiday booths) in the Greater Boston area where you can bring your friends and your food, attend events and even help build one (building opportunities in italics). Know of a Sukkah not on this list? Feel free to mention it in the comments section. Review: This Sukkah can be rickety at times but it’s got a good amount of room and is a nice place to meet fellow members of the tribe who work downtown. Review: History buffs will like that this Sukkah is located at a historic landmark! Help them build the Sukkah on Monday, 9/20 at 5:30 pm. Review: The world’s largest octagonal Sukkah, lots of table space and very bright. $18 will buy a non-Harvard Student a meal during the week. Review: This is a small one and there are no light fixtures so if you come at night bring your own. Review: Large Sukkah on a quite side street. Dairy Potluck on Wednesday night, 9/22. Review: Close to Central Square in a residential neighborhood and close to Trader Joes where you can pick up dinner. You can help build this one on 9/19 at 10am. Review: Feel free to bring your own food over or stop by on 9/16 for Sushi in the Sukkah with other young professionals – cover charge and all you can eat sushi. Review: Order anything from their store (pizza, calzones, Mexican, sushi, fish!) and enjoy it out back in the Sukkah. Review: Help this Jewish Social Justice House build and decorate their booth at 6pm on 9/19. Review: Huge Sukkah with a very high roof and lots of table space. Bring your own kosher food. Monday night Blues concert with food available for purchase on 9/27. Review: A big L shape sukkah, lit with twinkly lights and set in a wooded area. Review: Huge and fancy Sukkah (kosher food only). Sukkot Extravaganza – BBQ & music on 9/ 26 from 3-6 pm. Location: Chabad, 32 Loring St.
Review: On 9/26 come here for Pizza in the Hut – one of the best names for a Sukkah event. 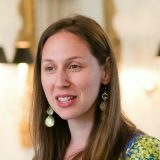 Elisha Gechter is the program manager of Wexner Israel Programs at Harvard Kennedy School and former associate director of community engagement for adult learning at Hebrew College. A graduate of the Hornstein-Heller MBA program at Brandeis University, she lives in Cambridge with her husband and daughter. She was named a 2015 Chai in the Hub honoree by Combined Jewish Philanthropies, and teaches for Hebrew College’s Eser and Parenting Through a Jewish Lens. Are You in The Mood to Join Me At Limmud?